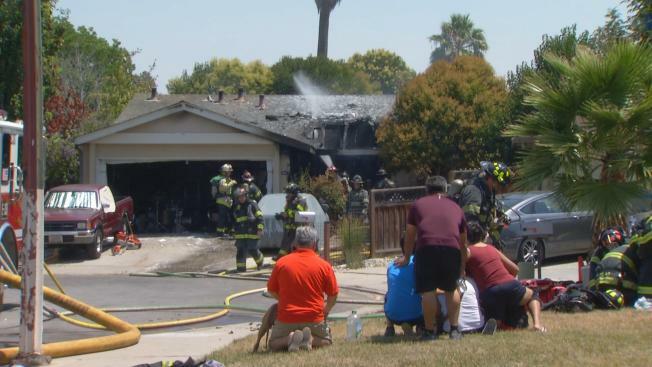 A two-alarm fire ripped through a South Bay residence Sunday afternoon, killing two family dogs, according to fire officials. The fire was reported on Birch Grove Drive in San Jose just before 12:30 p.m., San Jose Fire Department Capt. Brad Cloutier said. The flames were knocked down in less than an hour, but not without a heavy loss for the family. NBC Bay Area staff on scene reported that two of the family's four dogs were brought to safety by firefighters, but the other two were unable to be revived, Cloutier said. No matter who or what is trapped inside of a burning structure, Cloutier made it a point that fire crews try just as hard to save pets as they do people. "It's sad because pets are like family members," he said. Significant damage to the front of the home will likely displace three residents Sunday night, but no one was injured, Cloutier said.